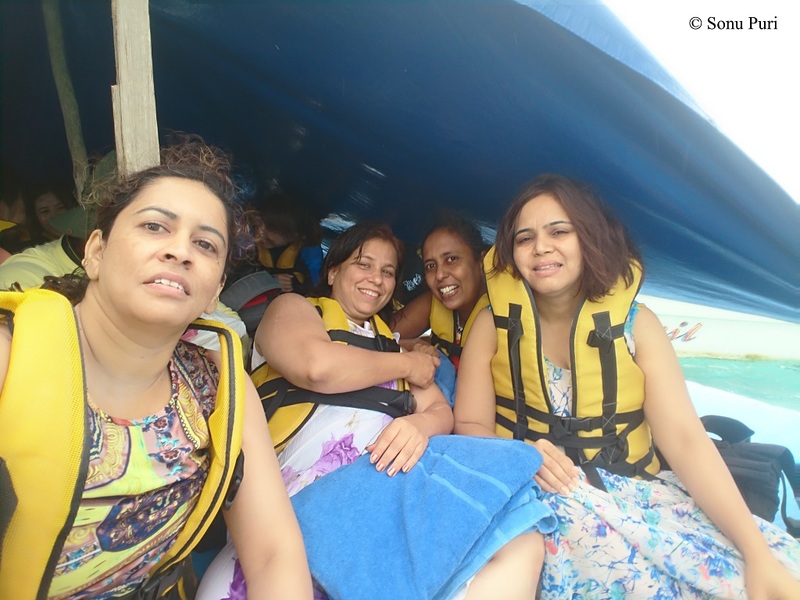 I along with my three school friends, Anshu, Sonu and Shweta, went on fun trip to Mauritius. Our South Mauritius tour was pre-booked but we picked the individual activities after we arrived. 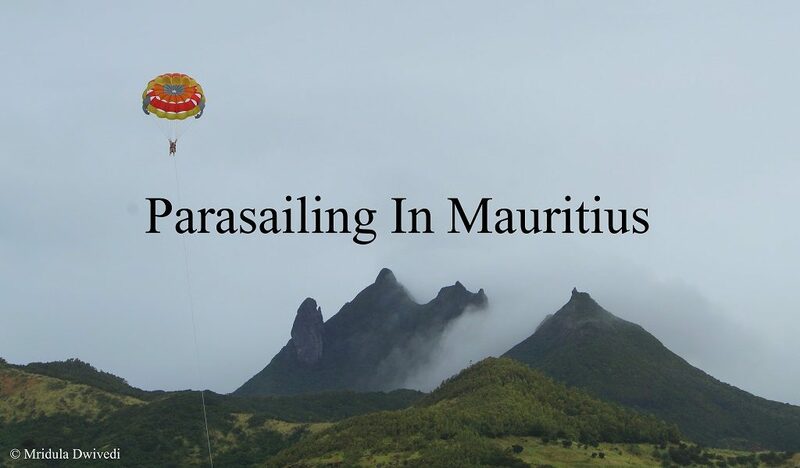 I never imagined parasailing in Mauritius was going to be so much fun! Two of my friends did everything that was available on the South tour, while Anshu and I decided to give helmet diving a miss. I did helmet diving in Boracay, Philippines and I was not too keen to do it again! 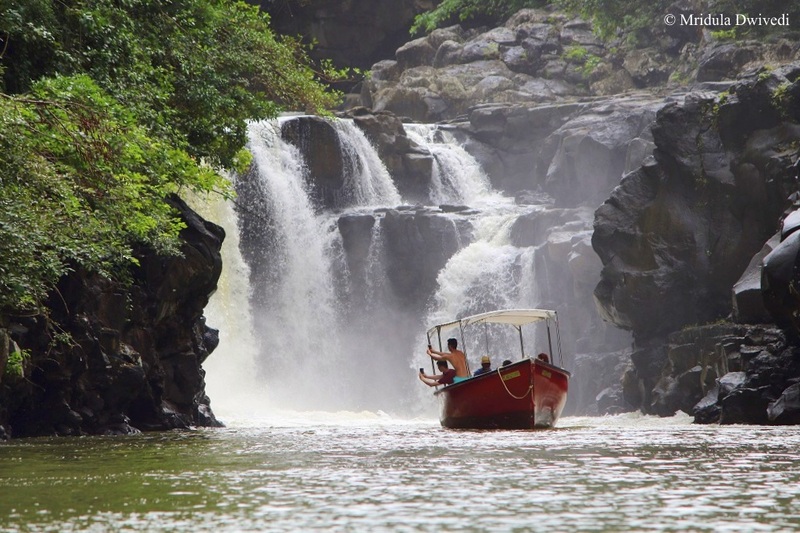 I opted for Parasailing and Waterfall trip and I was happy with my selection. I also gave the bumpy boat ride a miss which all three of my friends opted for! I have gone parasailing before in exotic locations, even my kids have done it. 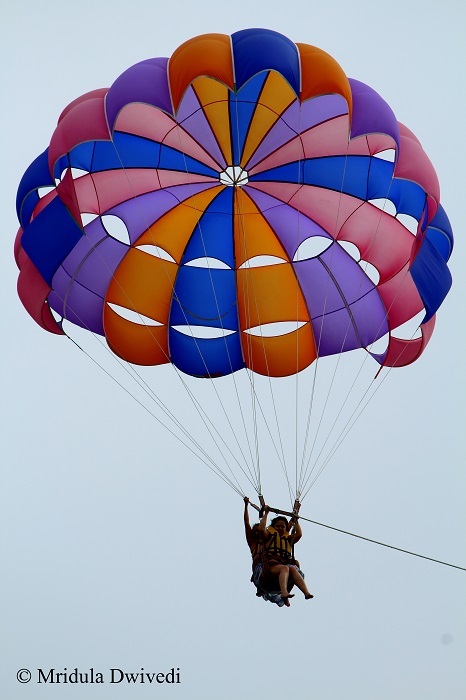 For me it was quite an experience to go parasailing both in Boracay and Goa. However, on the last two occasions it was the kind of the boat where you took off from the boat and landed back on the boat, doing nothing in the meanwhile, except enjoying the experience! Not so in Mauritius. To begin with, the rains gods were undecided. They lashed their fury for a while, we took shelter under a piece of canvas on the wooden platform. All activities were temporarily suspended. But then the gods changed their minds and the rains stopped. In Mauritius we were going up in pairs. Anshu and Sonu went together; I went with Shweta! But here you took off from a platform and landed back on it by yourself, all you needed was to follow the ground staff’s instructions and pull correctly on the strings. Sounds simple, right?Well, we shall see. Beaming Faces After the Perfect Landing! My friends went off first. After taking a round in the beautiful surroundings they made a perfect landing. Now it was our turn. I was the one who was going to pull down the strings to land. The ground staff told me as I was responsible for landing I could not carry the GoPro. I gave it to my friends on the ground. Soon, we were up in the air! I did try to enjoy the view but the landing was preying on my mind. What if I could not do it properly? The boat which pulled us, gave us the customary dip in the sea water and soon it was time to land. Taking a Tumble at the Landing! I was all concentration to follow the instructions of the ground crew. When they asked me to tug left, I did so. When they asked me to tug right I followed it as if my life depended on it! Then they asked me to pull right again and I could see they wanted me to pull more, so I used both my hands to pull right and soon we were there taking a tumble on the terra firma! Yes we did take a tumble at the landing but we were not hurt, in fact we were giggling. That is what adrenaline does to you I suppose? I asked one of the instructors later “what is the worst landing that you have seen?” He said normally nothing happens but sometimes people miss the wooden platform and land in the sea and we need to pull them back. Everyone wears a life jacket so that is the worst that can happen to you! As we headed out to Ile Aux Cerfs to enjoy our lunch and relax by the beach, the task of getting the people out of the water was underway. I thanked my lucky stars that it was not us, after all we only took a tumble on the platform! 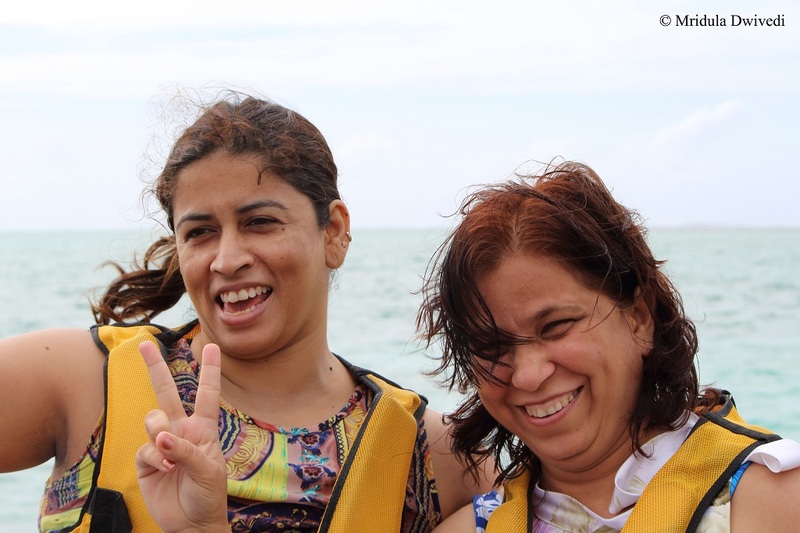 And that ladies and gentlemen sums up our experience of parasailing in Mauritius! Parasailing is fun if everything works in your favour. Also, on a sunny day the view from the top can only be imagined. 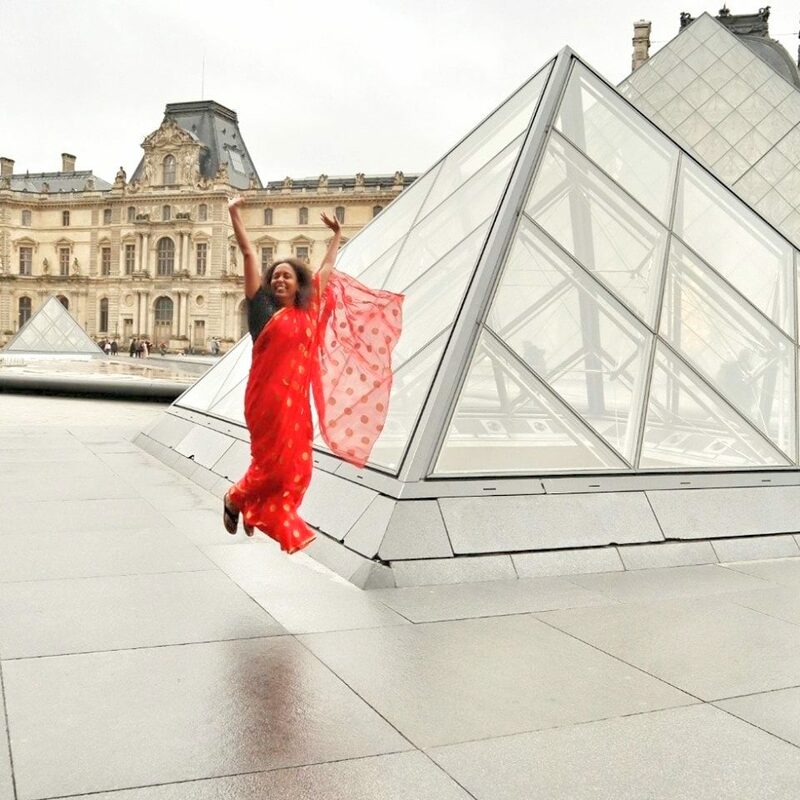 Sheer delight! I so agree with you. I wonder how I would feel if we landed in water! 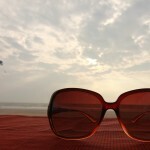 Mauritious is indeed a beautiful place and you enjoyed a lot !! It is more fun with school friends!